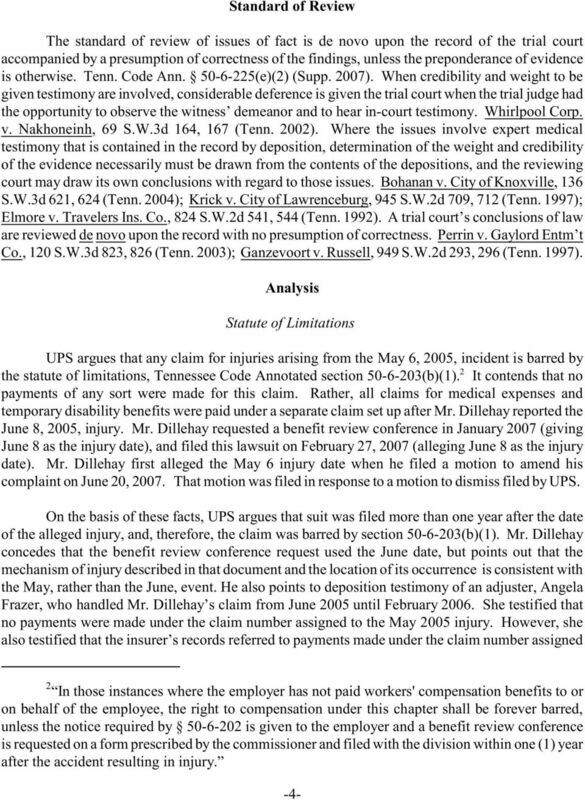 Download "IN THE SUPREME COURT OF TENNESSEE SPECIAL WORKERS COMPENSATION APPEALS PANEL AT NASHVILLE February 23, 2009 Session"
1 IN THE SUPREME COURT OF TENNESSEE SPECIAL WORKERS COMPENSATION APPEALS PANEL AT NASHVILLE February 23, 2009 Session DON R. DILLEHAY v. UNITED PARCEL SERVICE, INC. 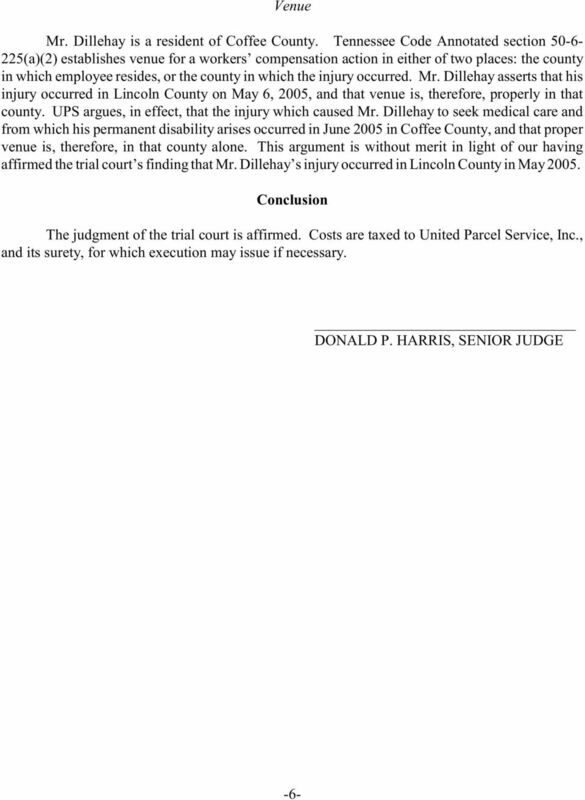 Direct Appeal from the Circuit Court for Lincoln County No. C F. Lee Russell, Judge No. 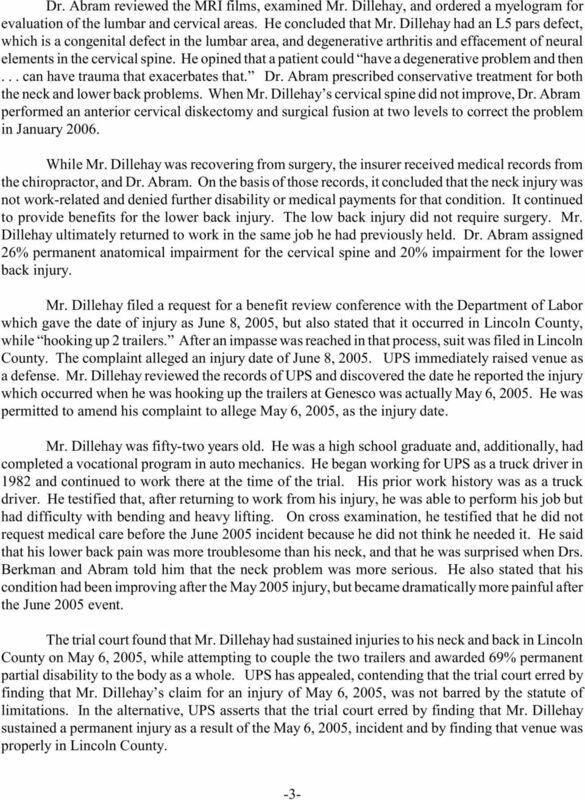 M WC-R3-WC - Mailed - June 15, 2009 Filed - August 17, 2009 In this workers compensation action, the employee alleged that he sustained injuries to his back and neck. He reported two separate injuries, about a month apart, that occurred in different counties. 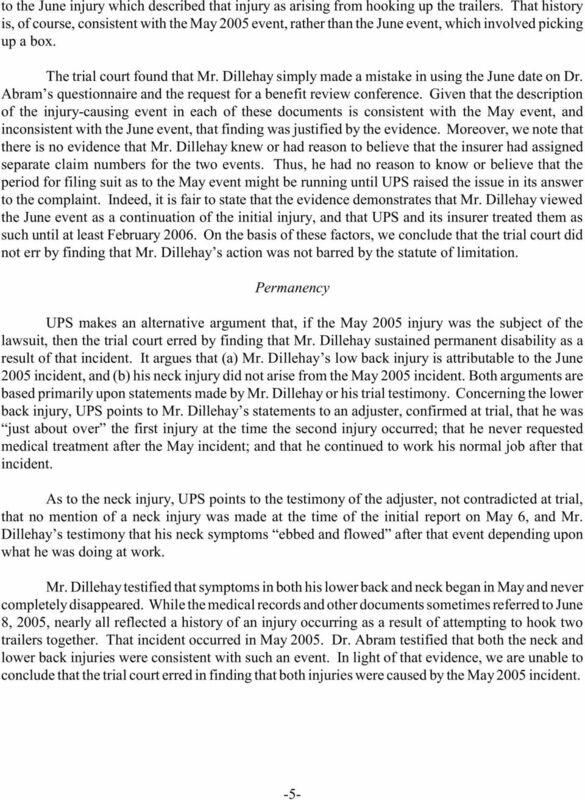 The employer accepted the back injury as compensable, but denied the neck injury. The trial court found both the back and neck injuries to be compensable, that the claim was not barred by the statute of limitations, and that venue was proper in the county of the first injury. The employer has appealed, 1 alleging the trial court findings were in error. We affirm the judgment. 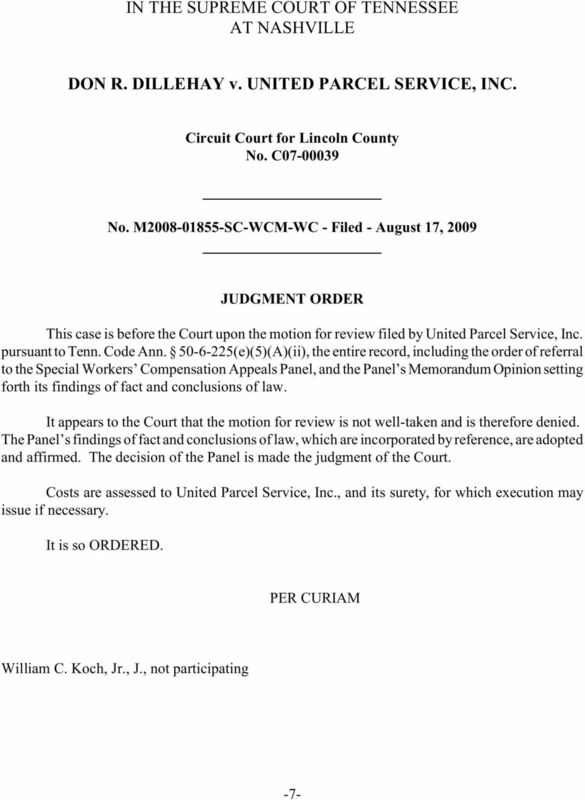 Tenn. Code Ann (e) (2008) Appeal as of Right; Judgment of the Circuit Court Affirmed DONALD P. HARRIS, SR. J., delivered the opinion of the court, in which WILLIAM C. KOCH, JR., J., and ALLEN W. WALLACE, SR. J., joined. David T. Hooper, Nashville, Tennessee, for the appellant, United Parcel Service. 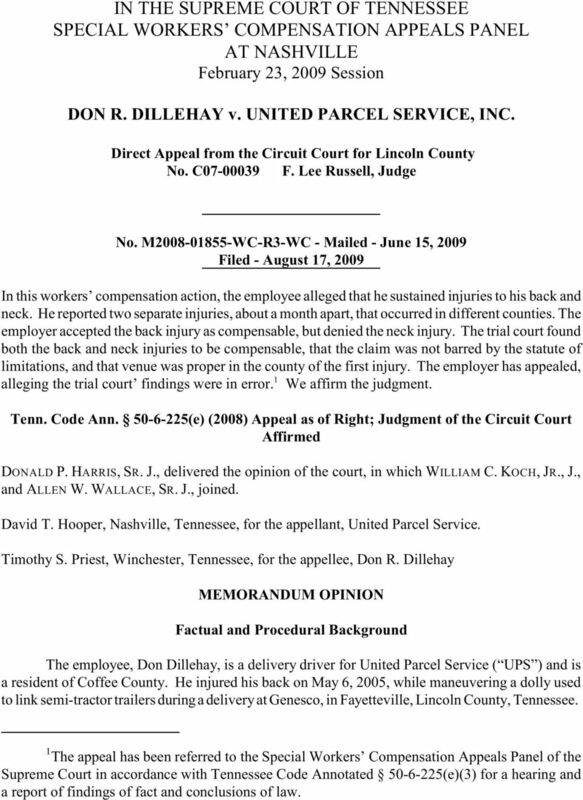 Timothy S. Priest, Winchester, Tennessee, for the appellee, Don R. Dillehay MEMORANDUM OPINION Factual and Procedural Background The employee, Don Dillehay, is a delivery driver for United Parcel Service ( UPS ) and is a resident of Coffee County. He injured his back on May 6, 2005, while maneuvering a dolly used to link semi-tractor trailers during a delivery at Genesco, in Fayetteville, Lincoln County, Tennessee. The appeal has been referred to the Special Workers Compensation Appeals Panel of the 1 Supreme Court in accordance with Tennessee Code Annotated (e)(3) for a hearing and a report of findings of fact and conclusions of law. APPEAL NO. 970713 FILED JUNE 4, 1997 This appeal arises under the Texas Workers' Compensation Act, TEX. LAB. CODE ANN. 401.001 et seq. (1989 Act). On March 3, 1997, a contested case hearing (CCH) was held. KAREN R. WOODS v. ACE-AMERICAN INSURANCE ET AL. NICOLE HARRISON, Petitioner, THE INDUSTRIAL COMMISSION OF ARIZONA, Respondent, CITY OF PHOENIX c/o YORK RISK SERVICES GROUP, Respondent Carrier.